Bellingham Politics and Economics: Race and Incarceration in Whatcom County and WA. "The hypersegregation of the black poor in ghetto communities has made the roundup easy. Confined to ghetto areas and lacking political power, the black poor are convenient targets. ... The enduring racial isolation of the ghetto poor has made them uniquely vulnerable in the War on Drugs. What happens to them does not directly affect—and is scarcely noticed by—the privileged beyond the ghetto’s invisible walls. Thus it is here, in the poverty-stricken, racially segregated ghettos, where the War on Poverty has been abandoned and factories have disappeared, that the drug war has been waged with the greatest ferocity. SWAT teams are deployed here; buy-and-bust operations are concentrated here; drug raids of apartment buildings occur here; stop-and-frisk operations occur on the streets here. Black and brown youth are the primary targets. [emphasis added -RMF]" -Michelle Alexander "The New Jim Crow"
Is Whatcom county a racist county in a racist state? I won't pretend to have the complete answer in this post. I do know that something Bellingham and Lynden (two of Whatcom County's biggest cities) have in common, is that you can often spend the whole day downtown in either without ever noticing a person of color! And that makes it somehow very different from where my wife and I grew up in Oakland, CA. 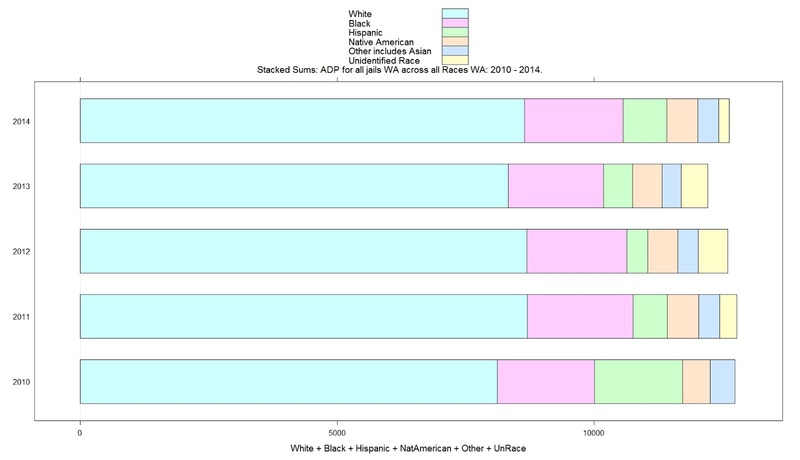 This post will examine the county jails of WA and question whether or not racial bias is a part of Whatcom County and Washington's law and justice system. Below is a table of WA state jails and their counts of Total Population, Average Daily Jail Populations of 'People of Color' (not white) and the all white populations of those 39 WA counties. 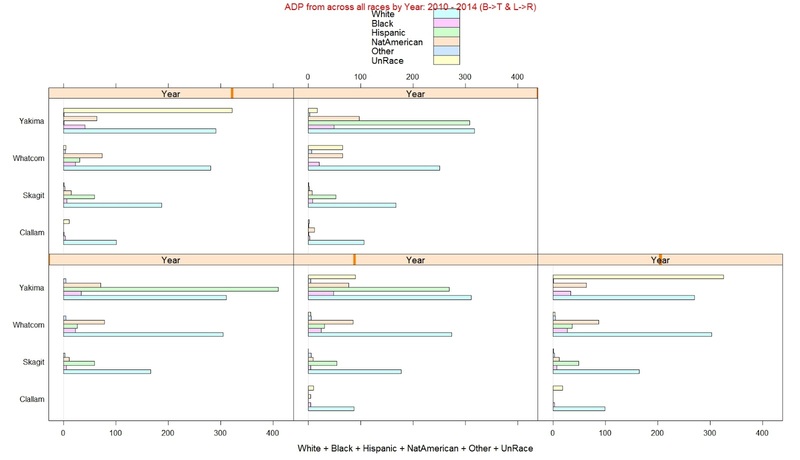 City and regional jail data is appended with no additional population data. 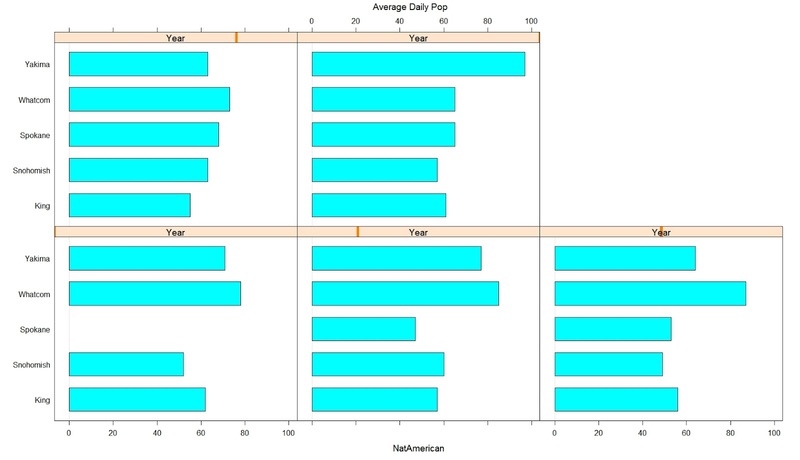 Some notes on the data and methodology: I explain below some of the disadvantages of working with Average Daily Population as data points and the problems matching the less granular WASPC with the more granular Census county population data. I will await more data from WASPC before publishing more. Code for this post is here. Analyzing racial composition ratios to look for implicit or explicit racism in the state law enforcement system is tricky, complicated and makes me nervous. My data sources[1,2] and code are public, so if you have some problem or thoughts with this, feel free to comment and link to your own statistical analysis. If you have some links to other statistical discussions on this subject, please let me know. Personal/Political Note: We are considering voting millions of dollars of sales taxes and bonds for an expanded jail system in Whatcom County this fall, so more information and viewpoints the better. The financing as is proposed now will be to continue 2/10 of 1% of a retail sales tax in perpetuity for public safety, operations, expansion. 1/10 of 1% will be used to bond for the original jail construction. That last 1/10% is said to send $6M /year to the bond holders and will probably sunset at 30 years. Either way, this is hundreds of millions of dollars sent to incarceration and law and justice needs. We aren't King County here. Whatcom County is max 215K people, and that total probably includes Canadian daytime shoppers and guests! I don't believe in a fascist or comfortable version of democracy. I've spent some time in my life reading the founding fathers and I don't think a comfortable democracy that supports the status quo is what they had in mind. Discussing racism is never comfortable for a county and state as white as Whatcom and Washington. I don't believe that lack of comfort makes the discussion any less urgent, important or necessary. such that K=0 would represents a ratio of White:NotWhite in the county jail equal with the county population ratio for White:NotWhite. 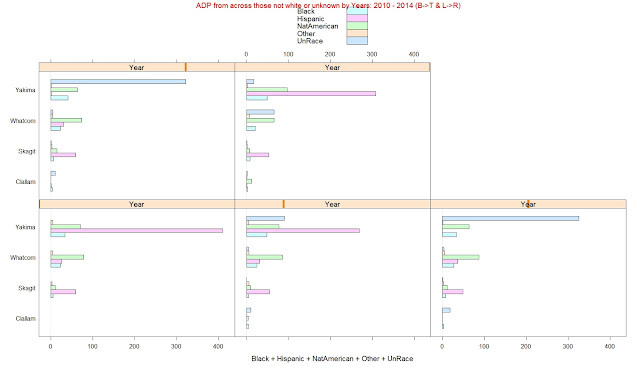 If K is negative, that county jail has a larger percentage of those white than the local county population. Unfortunately, that's not the case for most counties in WA. 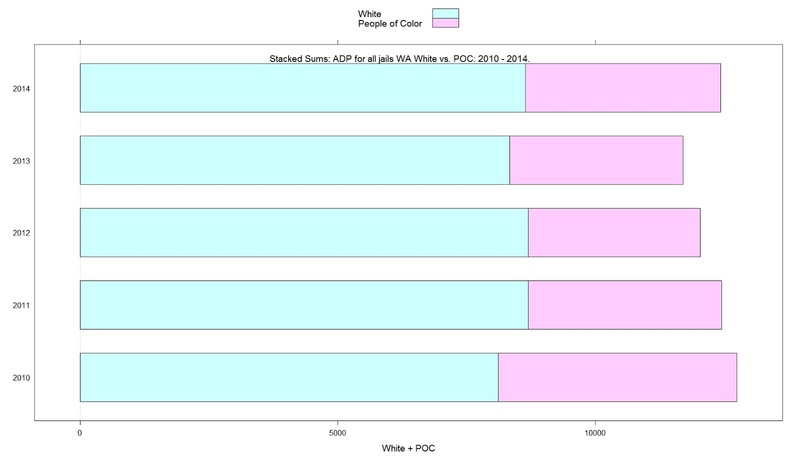 The summed counties of WA have a 10% K ratio indicating that state jail system incarcerates "People of Color" at a higher ratio than the representation of "People of Color" in the state. 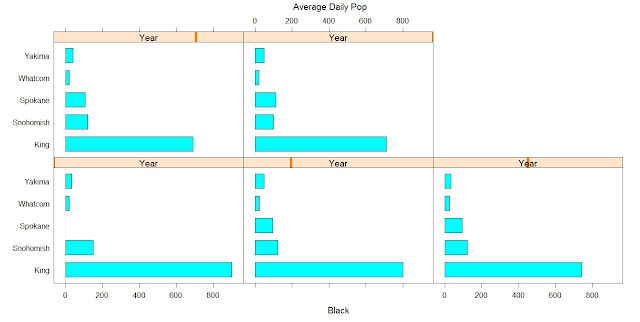 Matching the ratio of any particular race from the more granular Census racial categories with the less granular WASPC racial categories will have to be saved for another post and more data. Statistically, using average daily population as data points is poor and inaccurate statistical practice. I have asked the WASPC for the raw data and will republish this paper when I receive such. For now, averages as data points is all I have. There are lots of problems with a generalized statistic such as this, not the least of them being that counties lease beds from others and at least two counties (Douglas, Chelan) share a regional jail. However, at least 15 counties have K ratios over 9.9%. In the case of Whatcom County, clearly we are incarcerating both black and Native American at rates much higher than their representation in the general population. For city and some regional jails (bottom of this list), I do not compute K.
In her work "The New Jim Crow", Michelle Alexander defines an apartheid racial caste system which she labels as 'mass incarceration' This 'caste system' functions to racially oppress people of color and take as "collateral damage" those white prisoners caught in this system. With ratios of imprisonment in many counties in WA so clearly over represented by 'minority' racial populations, Ms. Alexander's framework has relevance for crime, law, and social justice in WA and Whatcom County. Below are some additional charts. Data in these charts is derived from the WASPC. 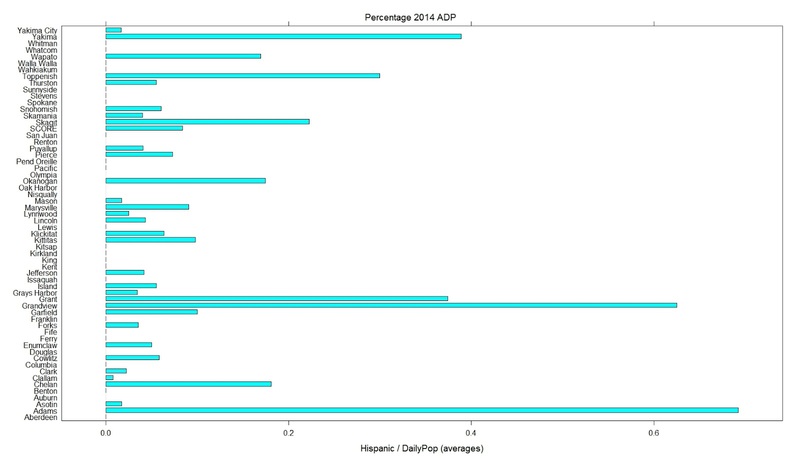 In the following three charts, 'Percentage ADP (Average Daily Population)' gives the percentage (listed on the horizontal axis in decimal) of Black, Hispanic, Native American in all WA county jails. Click to Enlarge the Charts! 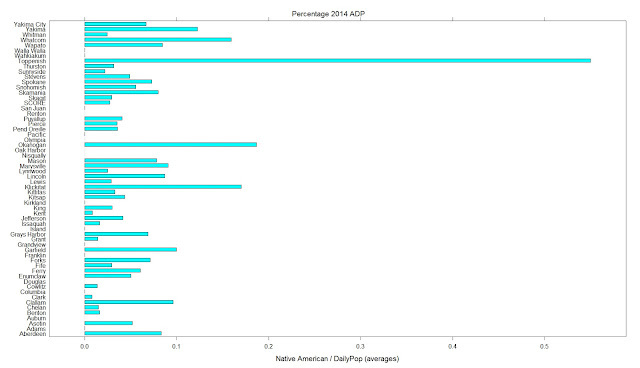 Native Americans are very clearly over represented in some of the county jails, particularly in Yakima and Whatcom which are much smaller counties by population than Spokane, Snohomish, and King. This chart compares those five counties for imcarceration of Native Americans by volume. The years 2010 - 2014 are represented bottom to top and left to right. 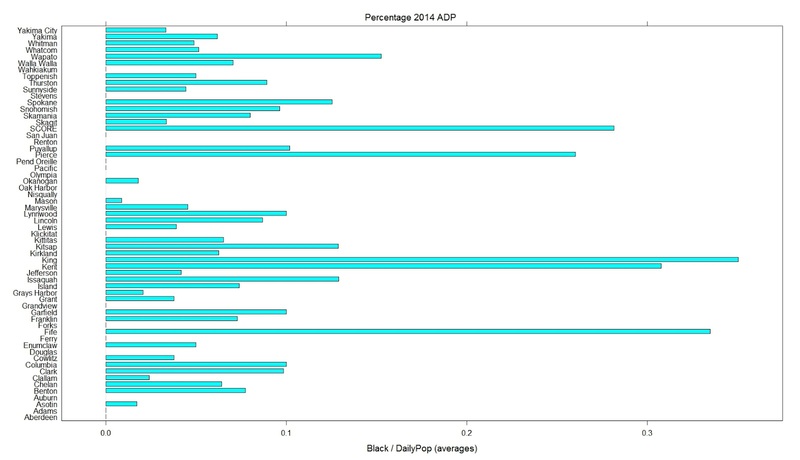 Both the nominal ADP (average daily population) and the percentage ADP (SpecificRace.ADP/ADP.Total) of some racial minorities is much smaller in some counties than others because of various factor like county size and the ratio of that jail population to that counties population. The following two charts look at Average Daily Population and Black.ADP/ADP (percentage) for Black Americans. In the second charts we can see that jails like SCORE and KING County have nearly 30% or more of their populations from Black Americans. Matching the ratio of any particular race from the more granular Census racial categories with the less granular WASPC racial categories will have to be saved for another post and more data. 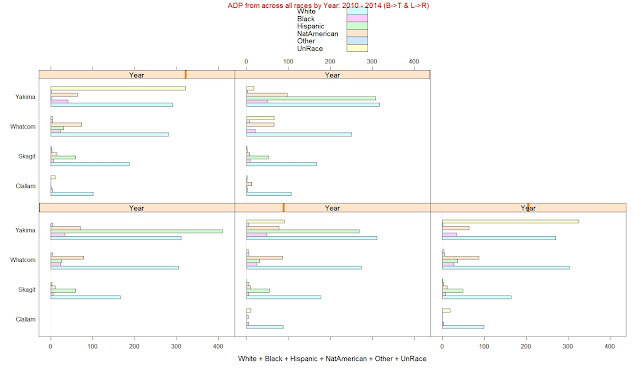 The next two charts give us representation of ADP for mid to small sized counties close to Whatcom in size and location. The first excludes those who are white.